"The Boxtrolls" tells the story of a young orphaned boy raised by charming and eccentric underground cave-dwelling trash collectors (boxtrolls) who tries to save his friends from an evil above-ground exterminator. It is based on the children's novel 'Here Be Monsters' by Alan Snow. This is splendid stop motion animation that is so good that you have a difficult time seeing the "stop" part. As is the case with a lot of stop motion these days, the film has dark and mysterious settings but lovably odd characters. The main human characters, Eggs and Winnie, are friendly, while the trolls are simply unfortunate societal rejects. The film stars Elle Fanning as Winnie, Tracy Morgan, Simon Pegg, and Ben Kingsley. It is directed by Graham Annable and Anthony Stacchi. 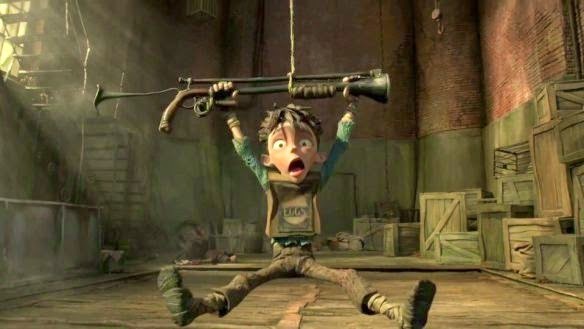 "The Boxtrolls" is produced by Laika Entertainment. Laika was the production company behind "Coraline" and "Corpse Bride," the Tim Burton and Henry Selick classics. They are good at dark and creepy stop motion animation. Release is scheduled for September 12, 2014 in the UK and September 26, 2014 in the US.